If you lose a tooth because of trauma or disease, a dental professional can create a dental implant to replace that tooth. 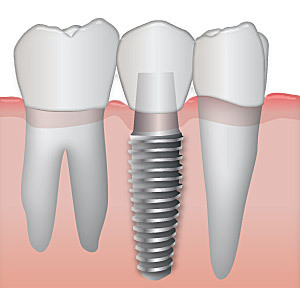 Implants are titanium rods that replace the root section of the missing tooth and serve as a base for either a porcelain or an acrylic plastic tooth. The etiology of bruxism (teeth grinding and clenching) has a multifactorial nature. In the past, morphological factors have been considered the main causative factors. Nowadays, these factors play only a small role, if any. Recent focus is more on pathophysiological factors. For example, bruxism has been suggested to be part of a sleep arousal response. In addition, bruxism appears to be modulated by various neurotransmitters in the central nervous system. Psychological factors are frequently mentioned in relation to bruxism as well. Taken all evidence together, bruxism appears to be mainly regulated centrally, not peripherally. Bruxism (tooth grinding and clenching) is a potential risk factor for implant failure and is generally considered a contraindication for dental implants, although the evidence is usually based on clinical experience only. So far, studies to the possible cause-and-effect relationship between bruxism and implant failure do not yield consistent and specific outcomes. This is partly due to the large variation in the technical and the biological aspects of the investigations. Although there is still no proof that bruxism causes overload of dental implants and their suprastructures, a careful approach is recommended. Practical advices as to minimize the chance of implant failure are given. How does bruxism affect the implant? Failure of implants can be classified as early and late. Early failures are the failures that can be seen in a short period of time after the insertion of the implant, while late failres are seen after a period of time. Excessive force is the primary cause of late implant complications. An appreciation of the etiology of crestal bone loss, failure of implants, failure to retain implant restorations, and fracture of components will lead the practitioner to develop a treatment plan that reduces force on implants and their restorations. The forces are considered in terms of magnitude, duration, direction, type, and magnification. The increase in force magnitude and duration on implants as a result of bruxism is a significant problem. Materials have a fatigue curve, which is related to the intensity and frequency of the force.18 There is a force of sufficient magnitude that one cycle causes a fracture (eg, karate blow to a piece of wood). However, if a force of lower magnitude repeatedly strikes an object, it will also fracture. The wire coat hanger that is bent does not break the first time, but repeated bending will fracture the material. This is not because the last bend was more forceful, but because of fatigue. A bruxing patient is at greater risk for implant fracture over time because the magnitude of the force will increase as the muscles become stronger and the number of cycles accumulates. The chance of an untoward outcome will increase if the force cannot be reduced in intensity and duration. How is the implant altered to reduce the effects of bruxism on it? Once the dentist has identified the source(s) of additional force on the implant system, the treatment plan is altered to contend with and reduce the negative sequelae on the bone, implant, and final restoration. One viable approach is to increase the implant-bone surface area. Additional implants can be placed to decrease stress on any one implant, and implants in molar regions should have an increased width. Use of more and wider implants decreases the strain on the prosthesis and also dissipates stress to the bone, especially at the crest. The additional implants should be positioned with intent to eliminate cantilevers when possible. 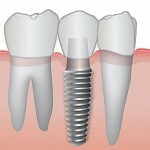 Greater surface area implant designs made of titanium alloy and with an external hex design can also prove advantageous. Anterior guidance in mandibular excursions further decreases force and eliminates or reduces lateral posterior force. Metal occlusal surfaces decrease the risk of porcelain fracture and do not require as much abutment reduction, which in turn enhances prosthesis retention. The retention of the final prosthesis or super-structure is also improved with additional implant abutments. Night guards designed with specific features also are a benefit to initially diagnose the influence of occlusal factors for the patient, and as importantly, to reduce the influence of extraneous stress on implants and implant-retained restorations. 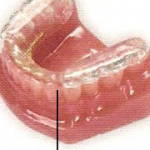 A night guard that promotes even occlusal contacts around the arch in centric-related occlusion, and provides posterior disclusion with anterior guidance in all excursions of the mandible, can be helpful in this regard. This device may be fabricated with 0.5- to 1-mm colored acrylic resin on the occlusal surface. 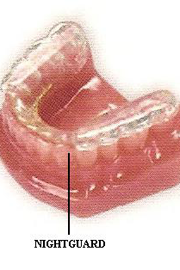 If the patient wears this device for 1 month, the influence of the occlusion on the bruxism habit may be directly observed.